It’s raining and the kids are stuck inside, right? Wrong. Instead of keeping the artsy entertainment indoors, take the artsy activities outside and use the rain to your advantage. Non-colorfast tissue paper is one of my favorite materials – for the very fact that it is non-colorfast. 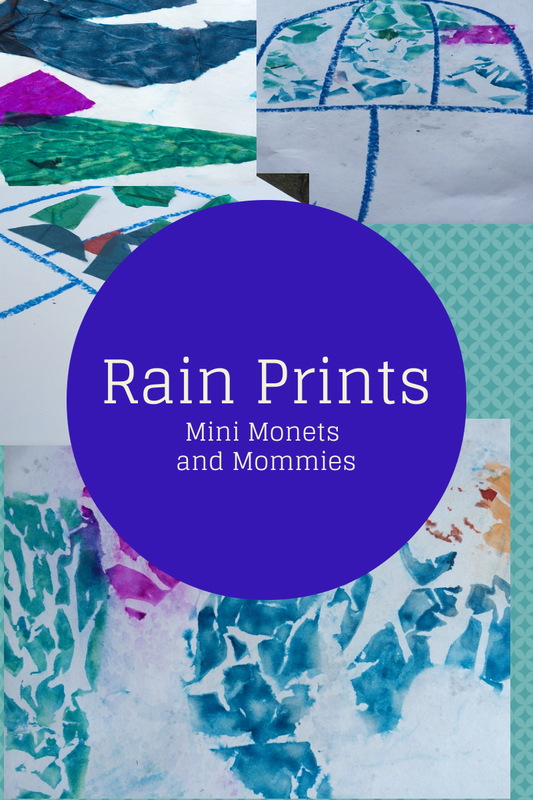 When it gets wet the color releases, leaving behind a whimsical watercolor-like effect. With that in mind, you can use this type of tissue to make rain water prints in the great outdoors on a not-so-nice day. · White paper- I used card stock. It’s thick enough not to tear when it gets wet (I’d stay away from construction or printer paper). · Non-colorfast tissue paper – If it says it doesn’t bleed, don’t use it. 1. Your young artist can either make a free-form abstract print or draw “something” first. Use waxy crayons or oil pastels to draw an outline first (if she is drawing an object). Avoid washable markers, as they’ll run along with the tissue paper. 2. Cut or tear pieces of tissue paper to add color or create a design. Choose bright, bold or dark colors. Pastels or light colors such as pink may look pretty, but the color won’t bled through well. I found that teal, dark blue, deep purple and green worked the best. 3. Place the pieces of tissue on the paper (or drawing). Don’t let your little one worry about pressing them flat. The wrinkles will make a textured pattern. 4. Carefully carry the paper outside (you’ll need to readjust it once you get outdoors). Put the paper on a flat surface. 5. Let the rain do its magic! You may need to have your child press down the tissue to make sure that it has direct contact with the paper’s surface. 6. After the paper is thoroughly wet, bring it inside. Carefully peel off the tissue paper. If it won’t come off, use a paper towel to gently roll of the remaining tissue. Great idea. I must try this with my kids. What a fun idea!! I love it! Thank you for sharing at Sharing Saturday!! Great idea. I'd never think to do this.